I'm a little afraid because this project sounds too similar to Pretty Noona who buys me food. I really enjoyed the first half of the drama but the last half disappointed me a little. I hope the writer of Spring Night don't use the cliché of 'her/his mother (or father/grandmother/grandfather...) is against of their relationship'. I'm glad Son Ye Jin has declined the offer. I love her but I think it's too soon to watching her and Jung Hae In as a couple in a drama (especially with the same Producing Director). And Han Ji Min is going to star three consecutive dramas (Familiar Wife, The light in your eyes/Dazzling and Spring night). I really hope she won't be too tired, because everyone knows how hard are some drama shootings. I think his shots will start after the drama 'Dazzling'. Or maybe it will start towards the end. Ji min is not too visible with her latest drama so i do think she can get to rest before filming this drama. My main issue here is the writer. SITR is good the first few episodes but i needed a lot of motivation watching it until the end. The mother is just so annoying. I hope the story will be different, relevant with the times. I like the PD but the writer might be a hit or miss. Spring﻿ Night has started filming this month. Considering quite late comparing other dramas that plan to air in May. But the PD is very confidence the schedule is comfortable timing for everyone. Also no more fantasy! It will be real people real issue. From soompi. Omo the annoying mother from SITR is also here. I hope her role is different oh please lol. Several actors have joined the cast lineup of Han Ji Min and Jung Hae In’s new MBC drama! On March 11, it was announced that Kim Chang Wan, Gil Hae Yeon, Oh Man Seok, and Seo Jeong Yeon will be starring in “Spring Night” (literal title). “Spring Night” is a drama centered around a longtime couple and the story of how they come to realize the new feelings of love that arise as they begin to look back on their relationship following their discussion of marriage. Producing director Ahn Pan Seok and writer Kim Eun from “Pretty Noona Who Buys Me Food” will collaborate once again for this drama. Han Ji Min and Jung Hae In were previously confirmed for the lead roles. The main leads look so beautiful together. Its clear that the show will be like that too. Upcoming MBC drama “Spring Night” (literal title) recently held its first script reading. 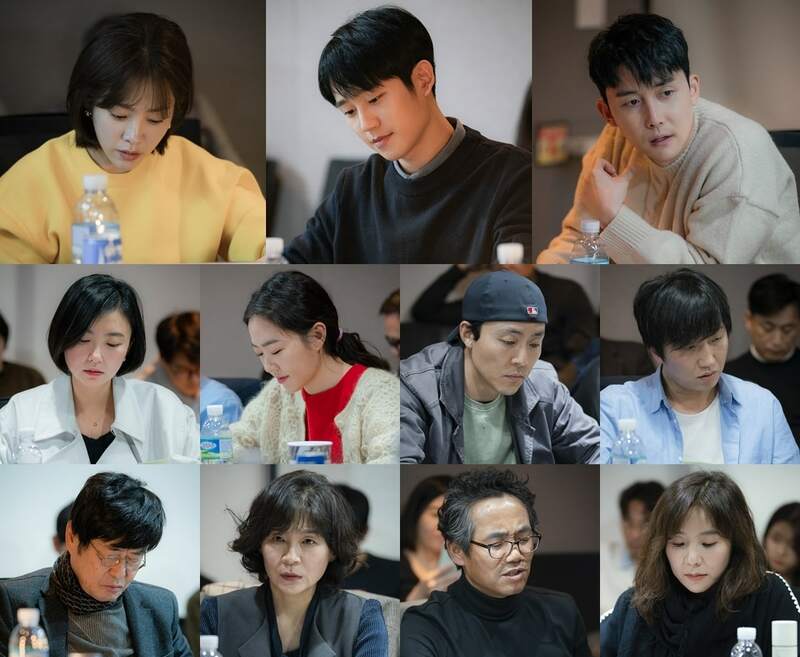 In attendance at the script reading were director Ahn Pan Suk and writer Kim Eun as well as actors Han Ji Min, Jung Hae In, Kim Jun Han, Im Sung Uhn, Joo Min Kyung, Lee Moo Saeng, Lee Chang Hoon, Kim Chang Wan, Gil Hae Yeon, Oh Man Seok, and Seo Jeong Yeon. Han Ji Min, who plays the local librarian Lee Jung In, filled the script reading with laughter with her lovely energy. She showed her professionalism as she conveyed the small changes in emotion of her character. Jung Hae In, who plays pharmacist Yoo Ji Ho, brought his character to life with his mature voice and magnetic gaze. Filling his character with emotion, he evoked his character’s charms. Kim Jun Han, who plays Lee Jung In’s boyfriend Kwon Ki Suk, perfectly pulled off the role with his affection for his on-screen girlfriend as well as his various tones and expressions. The director praised him saying, “It feels like you’ve been dating for 20 years.” Joo Min Kyung, who plays Lee Jung In’s little sister Lee Jae In, used her energy to bring out the robust charm in her character. “Spring Night” is slated to air its first episode in May. "Please enlighten me whether they are long term relationship or new relationship??"